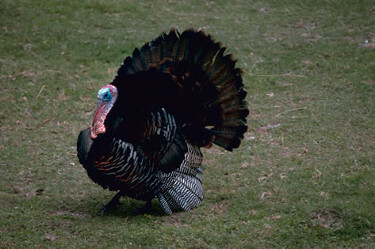 Habitat: Mature deciduous and mixed woodlands. In summer, frequents forest edges, forest clearings, and woodlands near agricultural areas. In winter, withdraws deep into the forest, preferring areas with mast-producing trees and some coniferous trees for roosting. Diet: Herbaceous vegetation, including buds, leaves, stems, roots, and tubers; seeds, grains, mast such as acorns and beechnuts, wild fruits and berries, insects and spiders. Sometimes, snails and small amphibians. 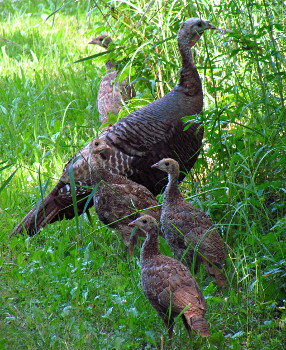 The Wild Turkey is found year-round in New England, excluding northern Maine.